Dubai, UAE, January 16, 2019: Problem – skin tone varies frequently but who has the budget for a wide range of foundations? 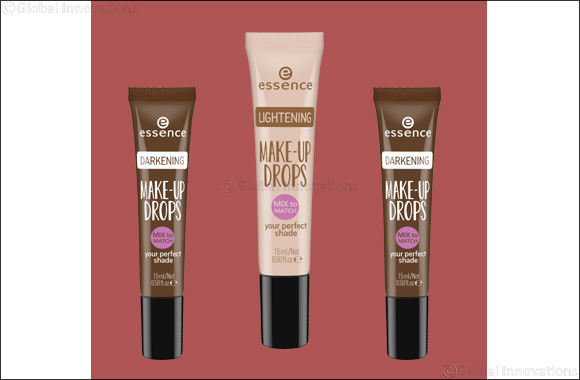 Answer is simple – the new essence Darkening / Lightening Make-up Drops that you can mix to find your perfect shade. The innovative liquid drops can be mixed with your favourite foundation in order to give either a lighter, or darker, skin tone as desired. No need to buy multiple pre-holiday, post-holiday, and no-holiday foundations with these handy colour adjustments. How does it work? Well, the highly pigmented liquid drops add color pigments to either your primer, liquid foundation or moisturizer, depending on desired level of coverage. Simply add 1-4 drops (depending on desired result) into the base, and blend well. They can also be used for contouring. The current fav technique taking the beauty industry by storm, contouring gives definition and design to your make up routine. Ideally you can use the darker make-up drops along the sides of your forehead and temples to create balance between the upper and lower half of your face. Then apply to the area directly below your cheekbones, starting from your ears to the middle of your cheeks and finally, a dab of the lightening make-up drops on the very tip of your chin and on your forehead between your eyebrow. Blend..Blend...Blend. The handy, crafty little drops are a girl’s best friend, ensuring the perfect depth of colour, whatever your complexion.